We all think we can tell the difference between information designed to deceive and journalism designed to inform. But how do we really know? Join Sally Lehrman in a discussion of this critical question in a climate of mistrust and misinformation. Lehrman, an award-winning journalist and Visiting Science & Justice Professor, founded and leads the The Trust Project, a consortium of top news companies that are developing publicly accessible standards for assessing the quality and credibility of the news you see online. Sally Lehrman is an award-winning reporter and writer specializing in medicine and science policy with an emphasis on genetics, race, and sexuality. 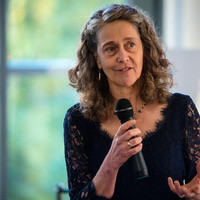 Lehrman is director of the journalism ethics program at the Markkula Center for Applied Ethics, leads its signature Trust Project, a complex international collaboration that she began building in 2015 to strengthen public confidence in the news through accountability and transparency. Lehrman has written for some of the most respected names in national print and broadcast media including Scientific American, Nature, Health, Salon.com, and The DNA Files, distributed by NPR. Co-Sponsored by the UC Santa Cruz Science and Justice Research Center and Kresge College’s Media & Society Seminar Series.